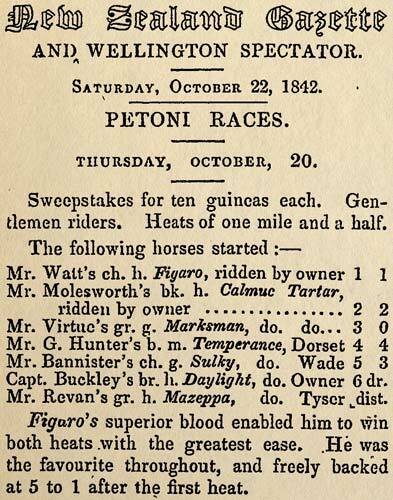 One of New Zealand's first full-scale race meetings was held at Petone, Wellington, in October 1842. This newspaper report gives the results and observes that Figaro, the only thoroughbred in the race, easily outclassed the other horses. Permission of the National Library of New Zealand, Te Puna Mātauranga o Aotearoa, must be obtained before any re-use of this image.